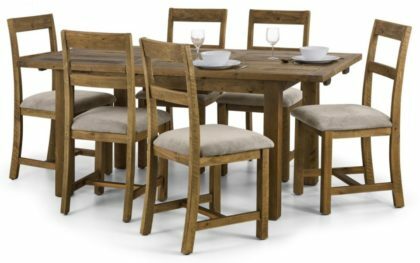 A rustic, rough sawn extending dining table with a chunky 40mm thick top in Solid Reclaimed Pine. The Aspen Dining Table features a 40cm butterfly extension system that is stored within the table when not in use.﻿﻿ Retaining the character of the timber's former use, including nail holes and saw marks, each piece is unique. The roughness of the wood gives the Aspen range a rustic feel and creates an "Industrial Look" that is at home in both modern and period surroundings.﻿ Matching Aspen Dining Chairs with padded Mink Chenille upholstered seatpads for extra comfort.